I interviewed Animal Collective for The Japan Times. The interview is about their experiences in Japan and their upcoming album “Centipede Hz”. the woods for the Taico Club festival last weekend, you were in for a big surprise. U.S. group Animal Collective blasted the 8,500-strong crowd in Nagano Prefecture with its own brand of experimental, acid-laced electronic beats through an imaginary hose. It was a highly anticipated set. 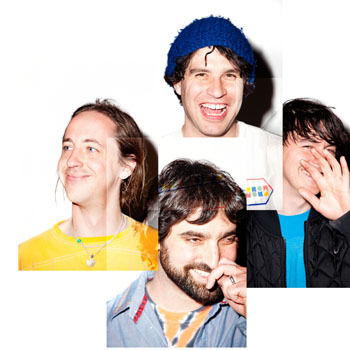 Animal Collective’s members â€” Noah “Panda Bear” Lennox, Josh “Deakin” Dibb, David “Avey Tare” Portner and Brian “Geologist” Weitz â€” are so popular on the indie-music scene that the adulation can border on satire. Casual listeners have nothing on avid online-forum users, who post hundreds of comments discussing solo work and tracking the progression of new songs as they are performed at each subsequent live set by trading bootlegs, interviews and gossip. Animal Collective last served up their sample-heavy electric pop on 2009’s “Merriweather Post Pavillion,” and considering it was almost universally acclaimed, the band now has a lot to live up to. Speaking to The Japan Times at distributor Hostess’ offices in Tokyo, Weitz admits he felt some pressure when making the album. He is also quick to note that the band’s success comes from the simple approach of just trying new things. “Some people were maybe thrown when Josh stopped playing with us for ‘Merriweather,’ ” Weitz says. “And those first few tours just playing samplers and stuff might have been a little weird for fans who’d gotten into us through (previous albums) ‘Feels’ or ‘Strawberry Jam’ but then you know, it turned into something really great. Fans aside, Weitz personally wants the newest Animal Collective record to be better than their last one, which is a tough feat this time around. Portner says the album’s live-performance influence came from the band getting together to jam properly for the first time since 2005’s “Feels.” Weitz commuted from Washington, D.C., and the rest of the band moved to Baltimore, where they grew up sharing tapes and practicing in Dibb’s mother’s barn. The new album conveys that feeling of a homecoming â€” when everything is nostalgic but at the same time alien and unknown. “We had so many good times growing up in Baltimore, but it’s weird to move back,” says Portner. “I moved back into a house with my girlfriend, which was right near the high school Brian and I went to, so I sort of drove those streets every day. And you know, we grew up playing at Josh’s mom’s house, which is where we wrote this record. It’s just kind of surreal to do that all over again. Weitz adds that “Wide Eyed” has a mechanical rhythm that suited the sound palette the band was working with. And it’s perhaps appropriate that Japan is the first to get a taste of the recently polished “Centipede Hz” tunes (Portner was happy that the crowd at Taico Club reacted enthusiastically to the new material), given the Asian influence that underlies a portion of the album. The last track, “Amanita,” with it’s tightly winding, heavily effected guitar riffs, sounds like it could have been wrung from the flute of a snake charmer in a smoky marketplace buried deep in India â€” if it weren’t so electronic and modern. Portner says a lot of the winding melodies may have come from days spent sifting through record-store bins in New York looking for vintage East Asian pop and folk. The tribal vibe may have waned, but the tempo remains â€” with Lennox jumping behind a full drum kit to crash and bash us through a slew of upbeat tunes. The result? Bongos, a big marching-band drum and a guiro. An oversized shaker instead of a high-hat also gives a Latin flair to the percussion. That space alien quality is exactly how the band wanted the album to feel. While album art has yet to be released, Weitz and Portner say fans can expect to see more of the extra-terrestrial theme. Despite the intergalactic themes, “Centipede Hz” won’t be completely alien to Animal Collective fans. The moment it begins the listener is hit face first with crashing drums and bright, beat-driven songs spliced with slippery, underwater synth. The lyrics are catchy, with lines such as “I like the hook” (“Mercury Man”) and “Makes me wonder why I even wrote this song” (“Monkey Riches”) likely to tickle the more ironic of the fan base. “Monkey Riches” also delivers the anthemic line “I don’t want to knock you down,” which will probably end up shouted on the dancefloors of indie clubs across Shibuya (and is a reason the track is my personal pick for the “big hit”). The chorus of “Father Time” presents Portner at his best vocally, his cries so red raw and desperate that it’s almost painful. “Centipede Hz” takes many of the elements of Animal Collective’s previous albums and melds them together. The psychedelic sludge of “Feels” and “Strawberry Jam” makes for a pleasant match with the dance-friendly samples of “Merriweather Post Pavillion” and the sweet folk tinges of early releases â€” making this the band’s most fully realized album to date. “Centipede Hz” is scheduled to be released in Japan in September. For more information, visit www.myanimalhome.net. Previous PostF in the classroom but A+ in the bedroom published in CityNext PostInterview with Gotye for the Japan Times.